It's been another wonderful, although very hot, Summer Market season at Williams Park, in downtown St. Pete and tomorrow is our last day of the Summer market season and we are going out with a bang! 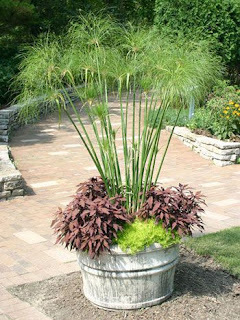 The plant at left, the Egyptian Papyrus, is one of our most popular plants. Moisture loving, they are perfect of course for water gardens and ponds. But many of our customers don't have a water feature but would still love to have the plant, so we are always suggesting ideas for using it in containers and making it shine. I found this pic on Pinterest this week, and especially for the budget minded gardener, it's a great idea and won't break the budget. These galvanized buckets can be found almost anywhere and they make the perfect container. We DO recommend still drilling some drainage holes in any container for the long term health of the plant. If you don't have an area in your garden where it can drain naturally in the ground, and say, want to have it on your patio etc, simply buy one of those plastic liner trays to put underneath. Our papyrus loves sun and we recommend at least 1/2 day of it. The long tall stems last a very long time, and if you have a container big enough, it will continue to produce offshoots from it's base. 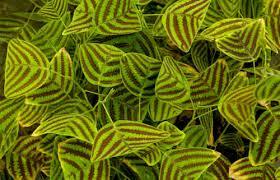 Our Butterfly Wing Plant (Christia obcordata) continues to be one of our most popular plants of the summer. Heat and sun loving, it has thrived even in this very hot summer of ours. We are growing ours on full southwest exposure but they will do great in shade/filtered areas too. So, come on out for our last day of the Summer market season on Sat. 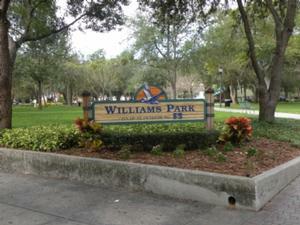 August 29th at Williams Park, downtown St. Pete and get your goodies as Market closes down for the month of September. Market hours are 9am-1pm, rain or shine ! And while Market is closed for the month of September, we will continue to be available for plant purchases at our place in St. Pete. Just give us a call or email and set up a time to visit us ! In September, we are doing a couple of events around St. Pete, so stay tuned for info about those. And of course, the first of October, we start up a brand new season of Market and Botanical shows around the state !